If you like to keep up with land development activity or want to know more about a proposed development in Chester County, check out the newly redesigned and expanded “Plan Review” webpage on our website. You will find dozens of informative reports and the webpage now features an interactive map containing details on plans that have been submitted for review. The Map also provides a link to the County review letter and can be used to generate prints, useful for many planning-related activities. We strongly recommend that users consult the local municipality for the most up to date information on plans currently under review but if you want a quick overview of activity in the queue the webpage is a useful resource. 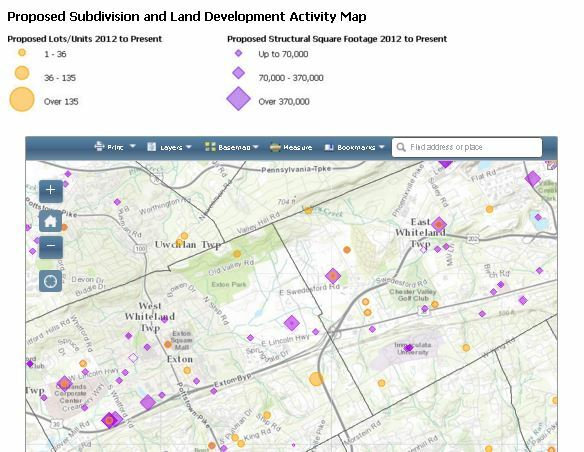 To see the Map and other useful reports on development activity in Chester County visit the web page at www.landscapes2.org/PlanReview/PlanReview.cfm.